The Bureau of Governmental Research has waded into the big-dollar tax dispute between Mayor LaToya Cantrell and the tourism industry with a recommendation that would deliver more dollars to the city of New Orleans – as Cantrell is seeking. The nonprofit BGR released a report on Wednesday that calls for giving the city an additional 1 percentage point of the sales taxes charged on hotel rooms. That would provide $12.3 million more to the city this year. BGR said the state Legislature could fulfill its recommendation either by charging hotel guests an additional 1 percent on top of the current 16.35 percent rate, if an analysis demonstrates it would not hurt tourism. Alternatively, BGR said the Legislature could safely increase the rate by 0.55 percentage points to 16.9 percent and make up the difference (0.45 percentage points) by redirecting a portion of existing hotel tax revenue from the tourism industry to the city. “That is money the City could have used to address pressing needs, including improvements to drainage, streets and public safety,” BGR’s researchers wrote, adding that their analysis showed that New Orleans receives a smaller cut than many comparable cities in the U.S. and that hotel guests in New Orleans would be willing to pay the higher tax. The report’s release comes amid a push by Cantrell to wrest more of the hotel tax revenue for the city’s decrepit roads and drainage systems – a push that has angered tourist industry leaders, who say they need every dollar they receive in order to strengthen and promote the city’s biggest industry. The tourism industry’s main spokesman, New Orleans & Co. President Stephen Perry, rejected BGR’s recommendation to increase the tax rate on hotel stays, arguing that a higher rate would make New Orleans less competitive with other major tourist-related cities. “The resulting falloff in visitor travel could be devastating to our local economy and to the city’s tax rolls, exacerbating every current challenge,” Perry said in a prepared statement. New Orleans & Co. released its own study Monday showing that New Orleans currently has the sixth highest hotel tax among 20 comparable cities. BGR said New Orleans falls in the middle of the hotel tax rate among 12 peer cities. Tourism groups – including the Convention Center, the Superdome Commission, New Orleans & Co. and the New Orleans Tourism Marketing Corp. – stand to receive about $151 million of an estimated $200 million in hotel tax revenue expected in 2019, while the city will receive just under $21 million, BGR said. In pushing for changes, Cantrell has argued that the city has pressing infrastructure needs, including $81 million per year to upgrade water and drainage systems. “As we have heard the Mayor say repeatedly: New Orleans needs and deserves her fair share of the revenue we generate,” Beau Tidwell, her spokesman, said in an email Monday that did not address BGR’s recommendations. 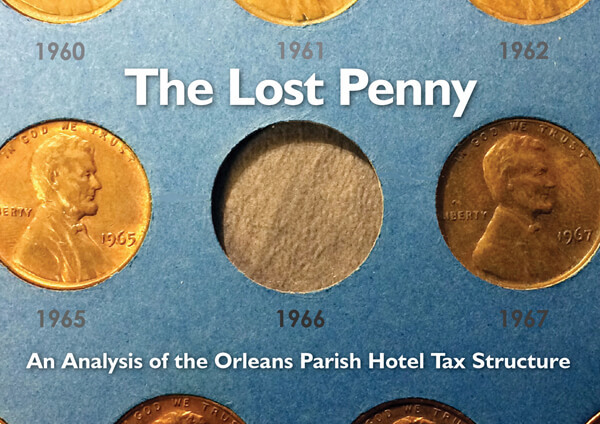 In its 41-page report, BGR reported a forgotten fact: That the city collected a 1 percent hotel tax until 1966 when, as part of a deal to establish the Saints’ franchise, city officials agreed to relinquish the tax in favor of giving the money to the Superdome Commission. BGR, a nonpartisan policy shop that publishes detailed reports on government spending and other issues, also recommended undertaking a close examination of tourism taxes to determine whether the Ernest N. Morial Convention Center is collecting more tax revenue than it needs. The Convention Center is sitting on $235 million in unrestricted reserves, up from $63 million in 2002. “The overall size of the reserve fund and its projected future growth raise questions about whether the Convention Center’s hotel taxes are appropriately scaled to its needs,” wrote BGR. The state entity is slated to collect about $65 million this year in taxes – about $50 million from its share of the hotel tax and $15 million from a 0.75 percent sales tax paid by all consumers of food and beverages in New Orleans. The Convention Center has been building up its reserves through taxes that were meant to pay for a massive expansion of the facility, BGR said. Those plans were scrapped after Hurricane Katrina, but the taxes have remained in place. The Convention Center’s board has approved a new plan that calls for issuing bonds and spending $557 million over five years to upgrade the facility’s meeting rooms, reconstruct its roof, build a so-called “linear park” that would include trees, fountains and art and make Convention Center Boulevard more pedestrian friendly, upgrade the building’s lobbies and subsidize construction of a 1,200-room hotel at its upriver end. Melvin Rodrigue, the president of the Convention Center board, said there aren’t any excess funds. “We maintain our long-standing position that continued reinvestment in this three million square foot state-owned asset is key and critical to the long-term fiscal health of our state and local economies and to maintaining our national competitiveness,” Rodrigue said. The report also suggested that the New Orleans City Council may be able to enact its own levy on hotel room guests to collect more money. It also called for greater transparency so that city residents can better understand how hotel tax dollars are collected and spent. Cantrell is facing a tough fight to obtain more hotel tax revenue. While she controls some levers within the city, including zoning, appointments and some funding, she has little direct leverage over state lawmakers and the Convention Center, which is a state entity. She needs the backing of the Legislature because state lawmakers have authority over the tax levied on hotel guests in New Orleans. Cantrell’s predecessor, Mitch Landrieu, tried and failed to grab more hotel tax revenue for the city. And so far, Cantrell has yet to make much headway. Gov. John Bel Edwards and state Senate President John Alario, R-Westwego, have sided with the tourism leaders. Pressed for her potential options, she said she is eying possibly capping the portion of the 16.35 percent hotel tax in which hotel owners have voluntarily agreed to tax their guests at an additional 1.75 percent. Under this idea, tax money collected above the cap would go to the city. Edwards immediately followed up Cantrell’s comments by saying he recognizes the city’s financial needs, but he did not publicly commit to a solution that would give her more dollars. Edwards and Cantrell met privately afterward, along with City Councilman Jay Banks, whose district includes the Convention Center and the Superdome. Staffs for the governor and mayor met last Wednesday to hash out the issue for the first time “and will meet on a regular basis,” said Christina Stephens, a spokeswoman for Edwards. Tourism industry leaders attempted to mollify the mayor in December by offering to reinstate a 0.55 percent sales tax on hotel rooms that just expired. It would provide $6.7 million a year to the city. Perry reiterated that offer on Wednesday even though Cantrell previously rejected it as too little. Edwards, for his part, would win acclaim in New Orleans for delivering more money for the city’s infrastructure needs – no small feat in an election year – but he cannot do so in a way that creates major angst in the tourism industry. “My job as governor is to try to strike the right balance between competing interests,” he noted to The Advocate editorial board last week while discussing another issue.